Echo Pad is a realtime multi-fx processor and looper, you can apply effects to an incoming audio signal as well as create loops with the various loopers. - Audiobus compatible apps. Echo Pad supports the Audiobus Effect slot. the Echo Pad + Audiobus tutorials on YouTube. - Inter-app Audio. Echo Pad supports Apple's Inter-app audio. - USB audio interfaces. Echo Pad works and sounds great when used with a USB audio interface such as the Apogee Jam, MIC, ONE, DUET, QUARTET, Focusrite 2i2, and more. - iOS device interfaces such as the iRig, iRig mic, etc. - Built in mic. The built in microphone on iOS devices and headphones can be used as a live input source with Echo Pad.
! - HOWEVER, please use headphones!!! Echo Pad is not meant to be used with iOS device's built in speakers. Using the built in speakers on iPads or iPhones can lead to feedback, like any live microphone and speaker can produce. If you absolutely, positively MUST use the built in speaker, please make sure to reduce your device's volume to below 70% to minimize the potential for feedback. Echo Pad's interface allows for fast, expressive control of the effects and loopers. All crucial controls are available in the main view for fast access. Let's have a look at the controls. For now, we'll focus mainly on the controls relating to the effects, as the loopers have their own dedicated section. See the "Using the Loopers" section here. By default, Echo Pad applies effects only when you are touching the screen, bypassing the effects when you take your finger off the screen. This is a common way XY control is used with effects, as it allows for quickly sending a particular part of a song or sound to the effect in an expressive manner. You can also freeze the effect in the current position by tapping the "FX Hold" button. Both configurations can be useful for different setups and songs. 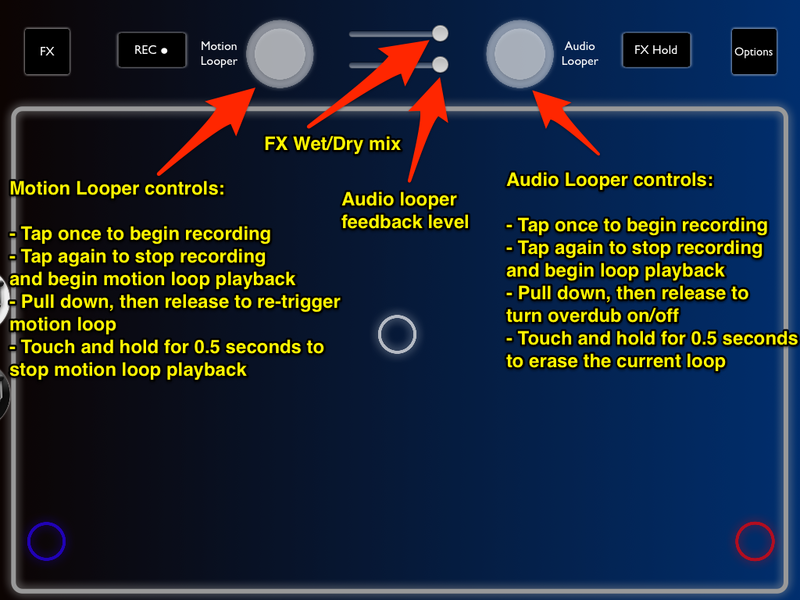 FX Wet/Dry Mix - Use this slider to blend the wet and dry signals. Delay time and feedback are controlled with the BLUE orb, which snaps to your finger's location immediately upon touching the screen. The BLUE orb's parameters are as follows. The delay repeats filters are controlled with the RED orb. The echo repeats are run through high and low pass filters to shape the sound of the delay. This allows for fine tuning the tone of the echo, to emulate the different characteristics of various analog delay pedals and tape echo units. The RED orb's parameters are as follows. Echo Pad has many different effects that can be accessed by tapping the "FX" button in the top left corner of the screen. This brings up a panel to choose your effects. The default effect is an analog/tape echo emulation. The current available effects are listed below. 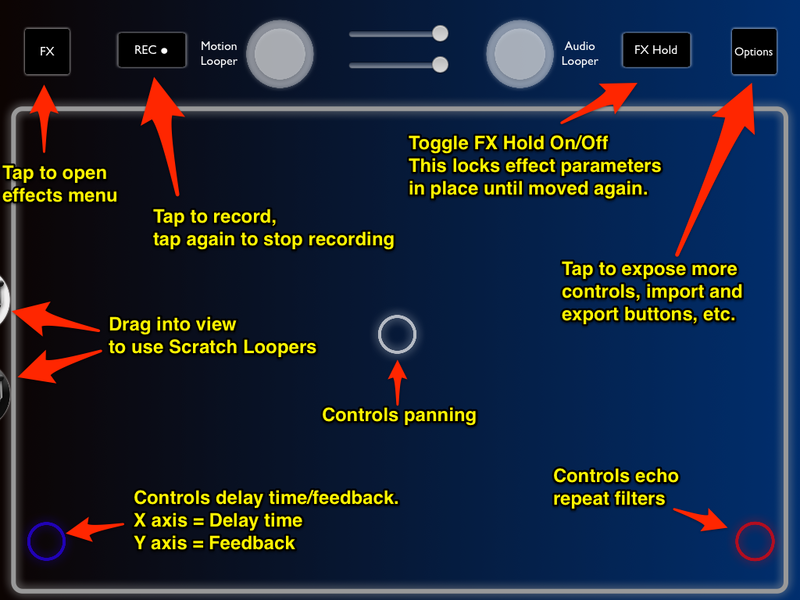 To access the expanded parameters for delay time including ducking, gated feedback,wow and flutter, multi-tap and more, tap the FX Menu button, then tap the Delay Tweak button. To hide the slider panel, tap the X in the right hand corner of the panel or tap the Delay Tweak button again in the FX Menu. This allows you to show and tweak the sliders when you want, and easily hide them out of the way when you don't need them. Gated - This button toggles gated feedback on/off. When enabled, feedback will be ducked down when receiving input signal, then return back to the level you previously set when input signal falls below threshold. This allows you to apply delay effects to only the last note played, for example. Give it a try! Feedback - Controls the amount of delay repeats. Delay Time - Controls the master delay time. R Chan Time - Controls the right channel delay time. Delay Mix - Sets the balance between dry and delayed signal. Wow Flutter - Sets the amount of wow and flutter applied to the delay repeats. Duck Sens. - Sets ducking sensitivity. Higher sensitivity creates a greater reduction in volume of the ducked delay/reverb trail. Duck Rel. - Sets ducking release time. This determines how long it takes for the ducked delay trail to return back to normal volume after the input signal falls below threshold. Tap Tempo - Tap to set the global tempo, useful for BPM synced delays. BPM Sync - Enables beat synced delays based on the global tempo, which can be set manually, by tap tempo, or by syncing to external MIDI clock. Delay Note Value buttons - Ranging from 1/1 (Whole note) to 1/64th note, these buttons set the delay time to a note value based on the current tempo. Dot. - Toggles dotted note values on/off. Tape Hiss - Sets volume level of tape hiss for added noise/character to delays. Tape Tone - Use to create darker or brighter delay tone. Tap 1 Time - Sets the delay time for Multi-tap delay tap 1. Tap 2 Time - Sets the delay time for Multi-tap delay tap 2. Tap 3 Time - Sets the delay time for Multi-tap delay tap 3. Tap 4 Time - Sets the delay time for Multi-tap delay tap 4. Tap 1 Vol. - Sets the output volume for Multi-tap delay tap 1. Tap 2 Vol. - Sets the output volume for Multi-tap delay tap 2. Tap 3 Vol. - Sets the output volume for Multi-tap delay tap 3. Tap 4 Vol. - Sets the output volume for Multi-tap delay tap 4. BPM - Sets the global tempo. Located in the FX Menu, these two buttons are used for randomized preset generation. Tapping either one of these buttons will create a random effects patch setting, perfect for inspiring new sounds quickly. There are two buttons for random preset generation, with slightly different behavior. - "???" - This button will generate a random preset, but it will not include any of the potentially "harsher" effects such as distortion and decimation. - RESET button - This button will clear the current effects settings and stop playback on any motion loops that are currently playing to start from scratch. To access more controls, tap the Options icon in the top right corner. On the right hand side, you'll see the slider and buttons for L.F.O. routing and controls. The L.F.O. is used to apply modulation to the delay time, master output filter, or both. L.F.O. Rate - controls the speed of the modulation applied. L.F.O. Amount - controls the depth/amount of modulation applied. Reverb Decay - sets the reverb decay time, short times give a light, more room like reverb tone, while long times create deep ambient reverberation. Reverb Level - sets the mix of the reverb versus dry signal. This subtle low pass filter is applied to the master output of Echo Pad. It is useful for darkening the overall tone, or applying the L.F.O. filter for modulated filtering. - BPM Sync turns on global BPM for Echo Pad so that the delays sync to this tempo. You can sync to external MIDI clock by enabling MIDI Input and BPM Sync. - Midi Input - use this button to enable or disable MIDI input. With MIDI input enabled, you can receive external MIDI clock as well as control Echo Pad's parameters via CC messages. MIDI Implementation chart for Echo Pad. - Midi Channel - Sets the channel which Echo Pad receives MIDI input from. - Enable Input - use this button to enable or disable audio input. This is useful for situations when you want to paste audio into the loopers and process them, without hearing background noise from the device's built in microphone. - BKG Audio - use this button to enable or disable background audio processing. Enabling background audio allows Echo Pad to continue running in the background while you use other music apps, including the iOS built in Music player. - Latency - Set Echo Pad's audio buffer size when running standalone. Buffer sizes can be set to 64, 128, 256, 512 or 1024 samples. Lower buffer sizes = lower latency. If you experience clicks/pops in audio, use a higher buffer size such as 512 or 1024 samples. - "Input Select" - Functions for selecting specific audio input channels. Echo Pad is compatible with audio interfaces designed for iOS such as the Apogee Jam, as well as many USB audio interfaces. Most single input devices like the Apogee Jam or IK Multimedia iRig devices will work best with Echo Pad's default audio input setting so there's no need to adjust it. This of course also works well when using the built-in microphone or headset microphones with your iPad or iPhone. When using a 2 input channel device such as the new Apogee ONE for iOS/Mac or Focusrite Scarlett 2i2, you may want to use a different input selection depending on what you have connected to your interface. - "Help Menu" - The help menu has 4 options. - Manual - opens up this online manual in mobile Safari. - Videos - opens up the Echo Pad online tutorial videos in YouTube. - Contact Support - For feature requests, bug reports and other issues, please fill out the online support ticket. - Stay in the loop - Sign up to the Holderness Media newsletter to receive occasional emails on important updates and new releases.
! - If you close Echo Pad when background mode is ON, you will see a red bar at the top of the screen that says "Echo Pad Recording". This is a bit confusing, as it does not actually mean that Echo Pad is recording, this is simply a default setting that all iOS apps display if they are processing audio in the background. To close Echo Pad completely when background audio is enabled, you must do the following steps. 1.) Double tap the home button to bring up the iOS taskbar. 2.) Swipe up on the icon and screenshot of Echo Pad to remove it. 1. 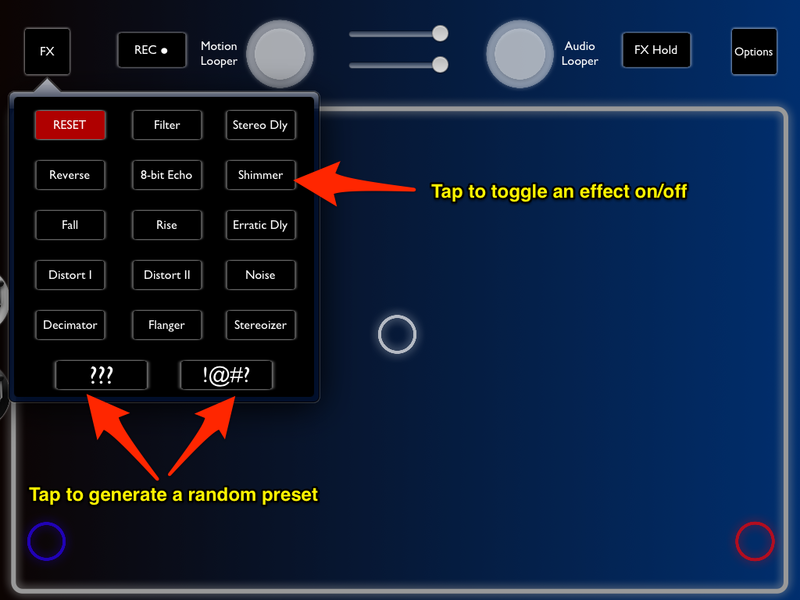 Once you have created a tone or motion loop that you would like to save, tap the "Save" button, then enter the name for the preset in the "Save FX Preset" box. The preset will be stored as "- User - whateverpreset". 2. To load a preset or motion loop, tap the "Load" button, then tap the preset you wish to load. Presets are organized as by Factory and User presets. 3. To share a preset by email, tap the preset you wish to share, then touch and hold its row. You will see an option pop up for "Share". Tap the share button to send the preset by email. 4. To import a preset from email, Dropbox, web, etc. do a long press on the preset icon, then choose to "Open In Echo Pad".